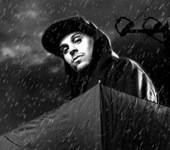 Michael Perretta, better known as Evidence, (born December 10, 1976) is an American hip hop artist, producer, and member of the rap group Dilated Peoples. Evidence is a native of Venice in Los Angeles, California and was born to a Puerto Rican father and a Russian-American mother. Additionally, before becoming a rapper and producer, Evidence was a well known graffiti artist.